WARNING: I have found no evidence to document that Malcolm MacLEOD (b. 1711) ever came to the New World. We do not know when he died, but he is documented as still alive and residing on the Isle of Raasay* in 1773, so he can't be the Malcolm MacLEOD said to have come to Vermont in 1753 and to have died there in 1777. His children, if he had any, have not been identified, which means the assertion that he had a son, Joseph, is completely unproven. But even if some other Malcolm MacLEOD had come to the New World, DNA test results now refute any possible biological connection between Joseph RASEY I of New England and the MacLEODs of Scotland. Over 100 individuals have been Y-DNA tested for the Clan MacLEOD project at FamilyTreeDNA, and this Malcolm MacLEOD's kin are Haplogroup R1b, while our Joseph RASEY I descendants are Haplogroup I2, making a recent common ancestor for them totally out of the question. Nor is Joseph related to any other individual in the MacLEOD DNA project, most of whom are R1b or R1a, while one is E3b and three are I1 (which means the latter four are not at all related to the rest of the MacLEODs, either). The bottom line is that not a single member of the MacLEOD Y-DNA project is Haplogroup I2, so there is zero probability that Joseph RASEY has a common ancestor with any of them within tens of thousands of years. Trotternish is the northeasternmost peninsula of the Isle of Skye, and Rigg is a village on its eastern shore, north of Portree. Totaroam is a village on the east coast of Skye, north of Portree, between Storr Lochs and Rigg. Joseph's alleged middle name of "Macleod" is apparently in support of the contention that he is the son of Malcolm MACLEOD of the Isle of Raasay, who supposedly immigrated to America and died in Bennington, VT, in 1777, after changing his name to Malcolm Macleod RASEY. I have, so far, found no primary records showing that there ever was a Malcolm MACLEOD or Malcolm RASEY in New England, nor anything else in support of what appears to be a romantic legend fabricated by Rev. Charles E. S. Rasay (1855-1937) and submitted to Edgar de Valcourt-Vermont's America Heraldica (see below). Alternatively — and I think this is probably more likely the case — Valcourt-Vermont may have fabricated the legend to butter-up Rev. Rasay, who was an acknowledged contributor of the book's Glossary. No one ever lost book sales telling people what they want to hear, which is a caveat to keep in mind with regard to all of these late 19th-century "vanity books" — they aren't called that disparaging term for no reason. Be aware that America Heraldica, like the LDS Ancestral File, is undocumented and in part compiled from patron submissions, so its entries cannot be taken as proven fact. The one proven fact we have here is that DNA test results make a connection between Joseph RASEY and Malcolm MacLEOD impossible — not just unproven, but impossible. 1. Database (online at the Associated Clan MacLeod Societies Genealogical Resources Center web site), which gives the lineage from Harold, "The Black," down to Alexander V, but not for the MacLEODs of Rigg. 2. Alick Morrison. [n.d.] "The Macleods of Lewis, with Several Septs including the Macleods of Raasay." From Loudoun H.D. Macleod, et al. The Macleods: The Genealogy of a Clan. 2nd. ed. Associated Clan Macleod Societies, Edinburgh (photocopies of key pages courtesty of Jim Tyler). This cadet branch of the Macleods of Raasay was descended from Alexander V of Raasay, whose second son, John, was its progenitor. He occupied the lands of Rigg in Trotternish. 2. MALCOLM, who was born in 1711 and served in the Jacobite Rising of 1745-1746, as a Captain with his cousin Malcolm X of Raasay. For his share in the Rising and especially for the part he played in helping the Prince to escape, he was arrested and put on board HMS Furnace on which, along with other Hebridean prisoners he was taken to Tilbury Fort, London, where he arrived on the 1st November 1746. He was, however, liberted by the Act of Indemnity (July 1747) and travelled North to Scotland with Flora MacDonald. Some years later, he settled down as tacksman [taxman] of Brae in Raasay. Dr. Johnson and James Boswell met him on the island in the autumn of 1773... It is not known when Captain Malcolm, popularly remembered in the Hebrides as Calum Mac Iain mhic Iain, died. He was married to Catherine, daughter of Angus MacQueen of Totaroam and it is said he had a son Norman, who emigrated to Prince Edward Island but his descendants cannot now be traced. 3. Edgar de Valcourt-Vermont, ed. 1886. America Heraldica: a Compilation of Coats of Arms, Crests and Mottoes of Prominent American Families Settled in This Country Before 1800. Brentano Bros., NY (available in PDF format on CD from George Wolf; "RASAY" section transcribed by Diana Gale Matthiesen). WARNING: This item shrieks fabricated! The founder of the family of RASAY, or RASEY, in America, was Malcolm MACLEOD, youngest brother of John MACLEOD, Laird of RASAY, who came to this country in 1753, and purchased land near Bennington, Vt., where he died and was buried in 1777. On his tombstone was engraved the inescutcheon we give, which was granted by the Young Pretender to the MACLEODS of RASAY, in recognition of the free and courageous hospitality offered him by the famous Malcolm, a cousin of the Clan Chief, and an intimate and devoted companion of the unfortunate Prince Charles Edward STUART. It will be remarked that the coat of arms given by Burke, as that of the RASAYS, is quite different from the one we reproduce—the inescutcheon even put aside. In fact, the Burke shield was granted in 1772 to some MACLEOD, who probably gave particular cause for satisfaction to the Hanoverian Dynasty, whilst the devices we give—and which were found on the colonist's seal—are acknowledged in Papworth's Ordinary of Arms as the ancient shield of this distinguished Scottish family. 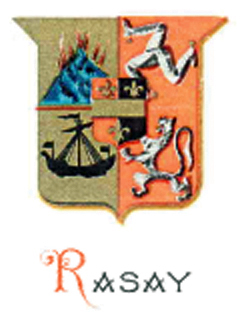 The present family of RASEY, in America, possesses a clear pedigree up to the emigrant, Malcolm MACLEOD of RASAY. A. The sun in his splendor. B. A demi-raven, sable, issuing from a ducal coronet, or. PAPWORTH AND MORANT: An Ordinary of British Armorials, 1874. SIR BERNARD BURKE: The General Armory of England, Scotland, etc., 1884. BROWNE: History of the Highlands and Highland Clans. MACLAUGHLAN: History of the Scottish Highlands. McIAN: Costmes of the Scottish Clans, with Historical Notes, etc. ARMS: Quarterly—1st: Or, a mountain, az., inflamed: proper. 2nd: Gu., the three legs of the Island of Man, armed: proper—conjoined in the center at the upper end of the thigh, flexed in triangle, the spurs, or. 3d: Or, a galley, sails furled, pennons flying, sa. 4th: Gu., a lion, rampant, arg. En surtout, an inescutcheon, party per pale, gu. and sa., a fess, between three fleurs-de-lis, or.